When Easter rolls around, grocery store displays explode with chocolate eggs, jellybeans, and marshmallow bunnies. My kids love these but I can only give them so much. 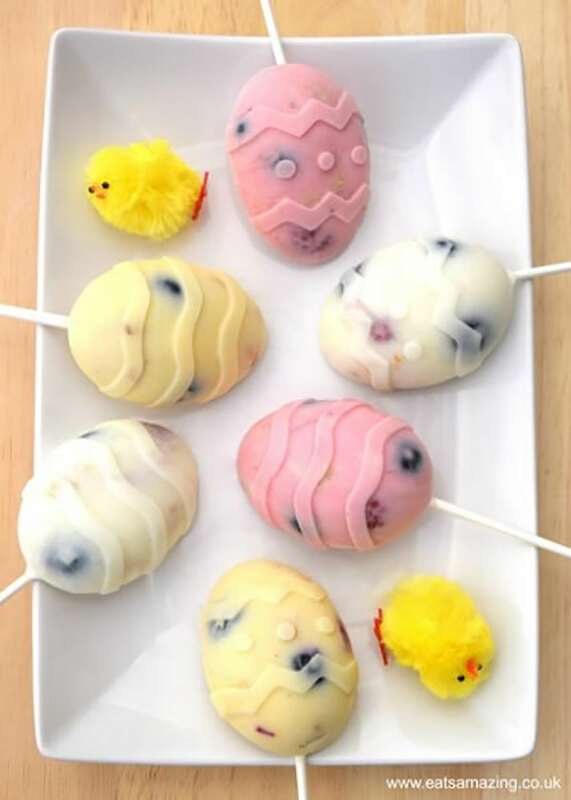 That’s why I’ve found 12 Healthy Easter Treat Recipes, that are kid approved. All those sugary treats seem to be staples of the spring holiday, there are plenty of healthy alternatives that can be just as festive. 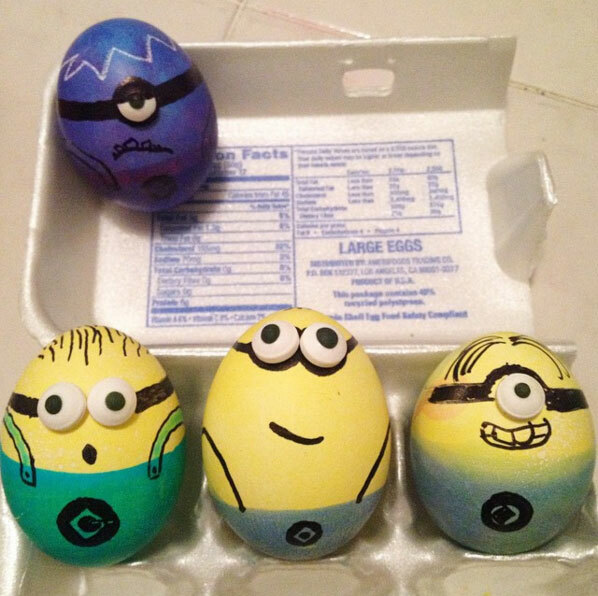 Whether you’re making Easter treats for an event, or you’re looking for a fun activity for your kids. These will sure to get everyone in the family in the Easter spirit. Pomegranate seeds and blueberries give this beautiful holiday bark pops of Easter egg-like color and lots of antioxidants. 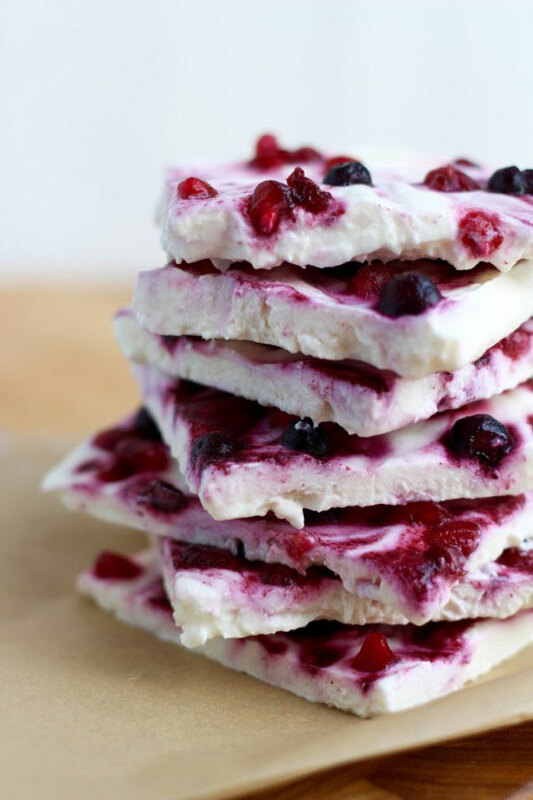 Since it’s made with Greek yogurt (instead of sugar-laced white chocolate), it’s a great way to sneak some protein into a sweet treat. Get the recipe from Mrs. Happy Homemaker. Photo by Mrs. Happy Homemaker. 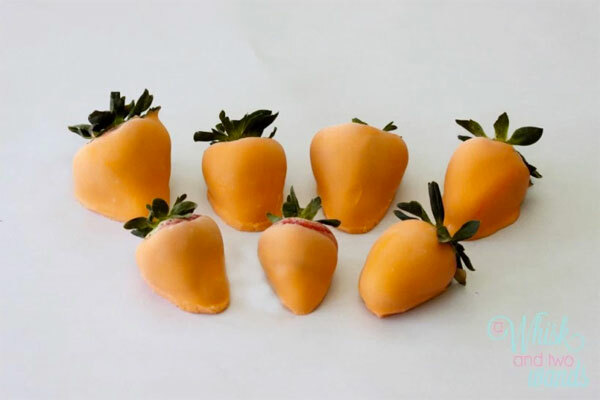 Even if your kids don’t love to munch on carrots, they’re sure to love these fruit faux “carrots” that are perfect for the season. Get the recipe from A Whisk and Two Wands. Photo by A Whisk and Two Wands. Take your egg-decorating game to the next level with these adorably devious minions from @hannah_rex. They’re simpler to make than they look – all you need are blue and yellow dye, a sharpie, and a steady hand. Dunk the whole egg in yellow dye until it’s completely colored, let it dry, and then hold the bottom half of the egg in blue dye for one to two minutes. Googly eyes available at your local craft store make these cheerful characters come to life, but they can also be drawn on. For those who prefer something a bit more conniving, a purple minion will get kids giggling. 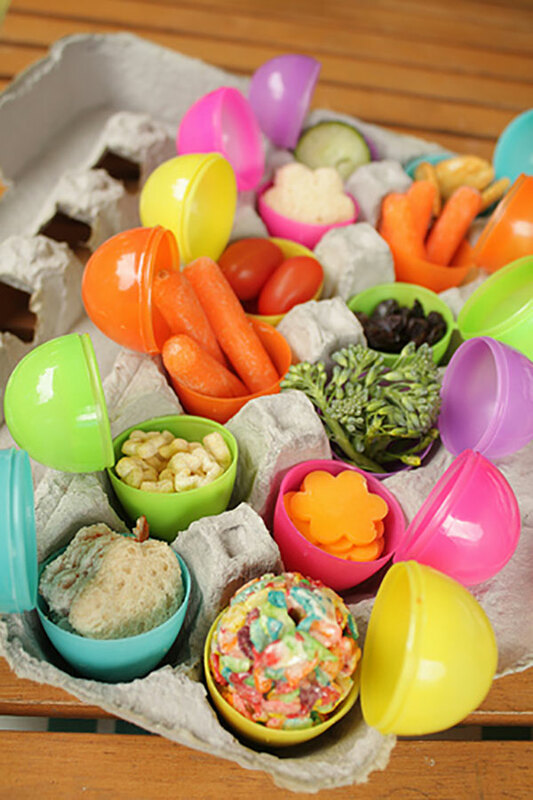 This idea from A Kailo Chic Life makes lunchtime fun with veggies, crackers, fruit, and bite-sized sandwiches packed in colorful plastic eggs served in an egg carton. They’re like a fun version of Portion Fix containers, but for kids! Photo by A Kailo Chic Life. Bring a little springtime spirit to snack time with this super simple take on cheese and crackers. 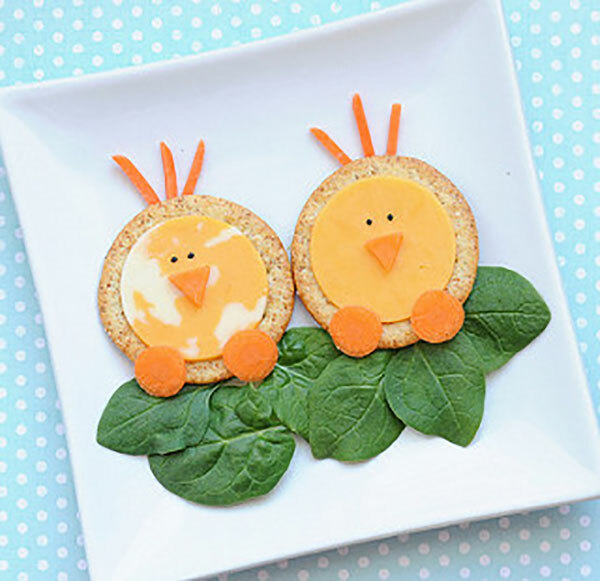 All you need to make these chicks are round whole-wheat crackers, cheese, baby carrots, and a handful of spinach leaves. Find out how to make them here. Taste and Tell turned the simple snack of carrots and hummus into an Easter party centerpiece. 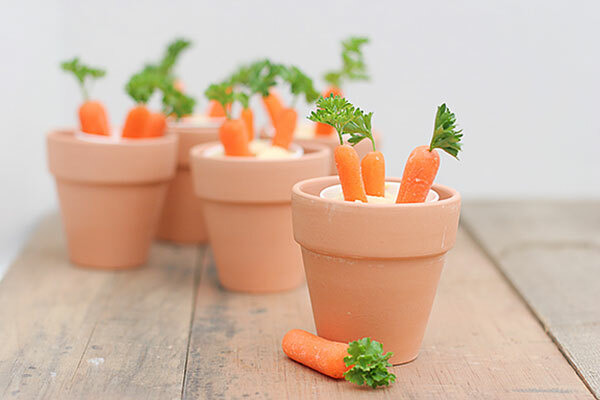 She made individual carrot servings by dipping carrots topped with parsley leaves into tiny flowerpots filled with hummus. Photo by Taste and Tell. If your part of the country is hit with a springtime heatwave, you’ll need something refreshing to feed your kids when they finish running around outside searching for hidden Easter eggs. These popsicles from Eats Amazing are a healthy, frozen treat made with yogurt, sweet berries, and crunchy granola mixed together and frozen in egg-shaped molds. 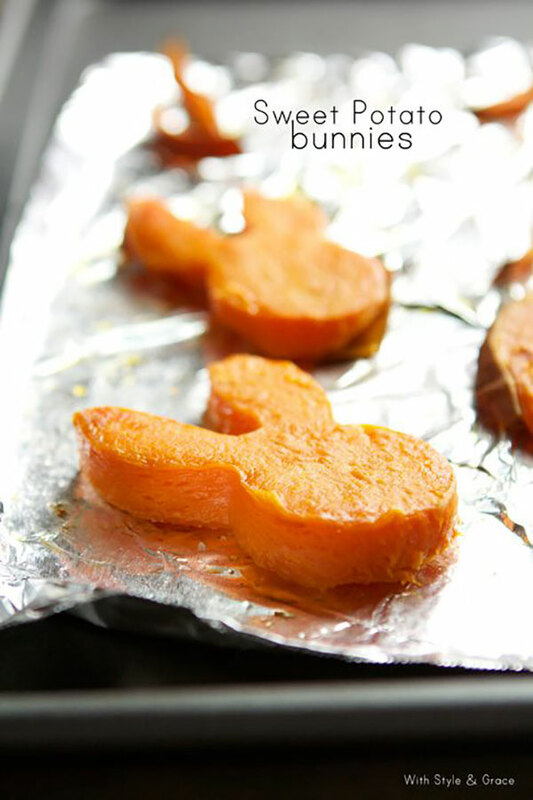 All you need to make this Easter-inspired snack from With Style and Grace are sweet potatoes and a bunny-shaped cookie cutter. If you don’t have a cookie cutter, try your hand at shaping slices of sweet potato with a sharp paring knife. Spray them with nonstick cooking spray and bake them until soft for a healthy and adorable Easter side dish. Photo by With Style and Grace. We know that April showers bring May flowers, but when Easter falls in March, Mother Nature might need help in the floral department. 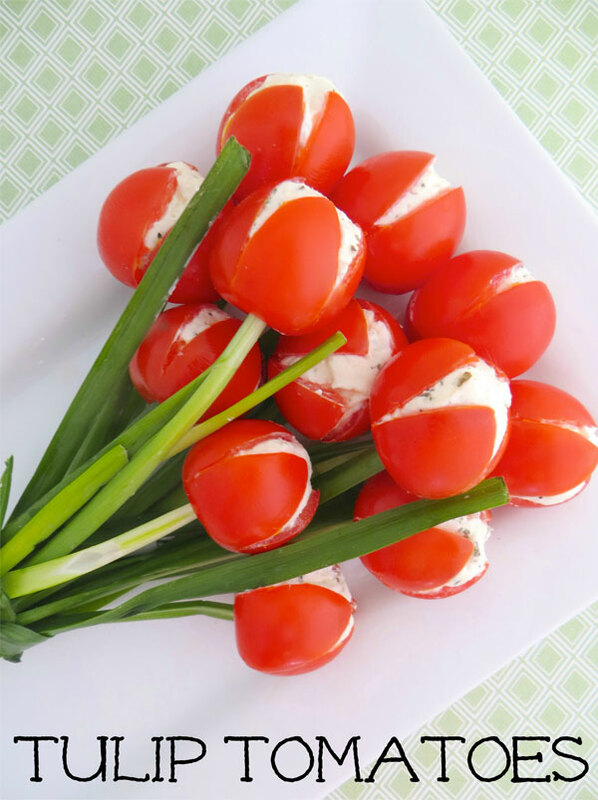 Brighten up any spread with these tulips made from cherry tomatoes, chives, and cheese. Use Neufchatel or ricotta cheese to keep this treat both healthy and beautiful. Get the recipe from Surviving a Teacher’s Salary. Photo by Surviving a Teacher’s Salary. Kick off Easter morning with with a darling bunny pancake breakfast like this one from Nico and Lala. 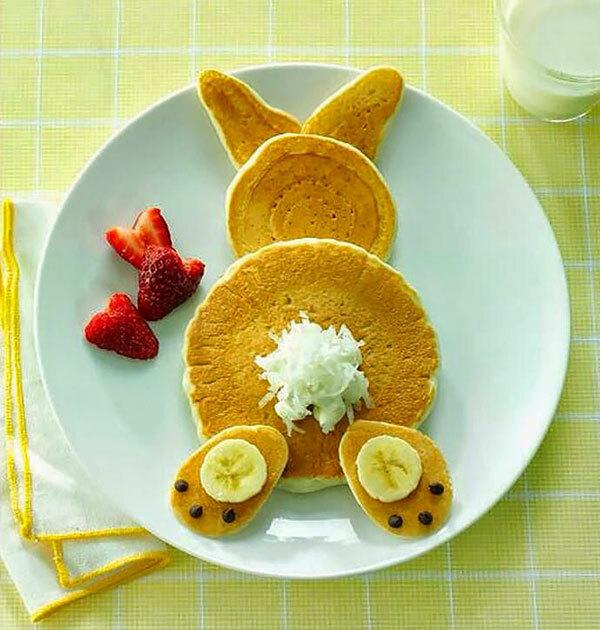 Whip up a batch of Multi-Grain Banana Pancakes in sizes to make the bunny body, head, ears and feet. Decorate the paws with banana slices and mini chocolate chips, and fashion a fluffy tail from shredded coconut. Photo by Nico and Lala. This snack idea from Artsy Craftsy Mom presents a cheerful Spring scene. 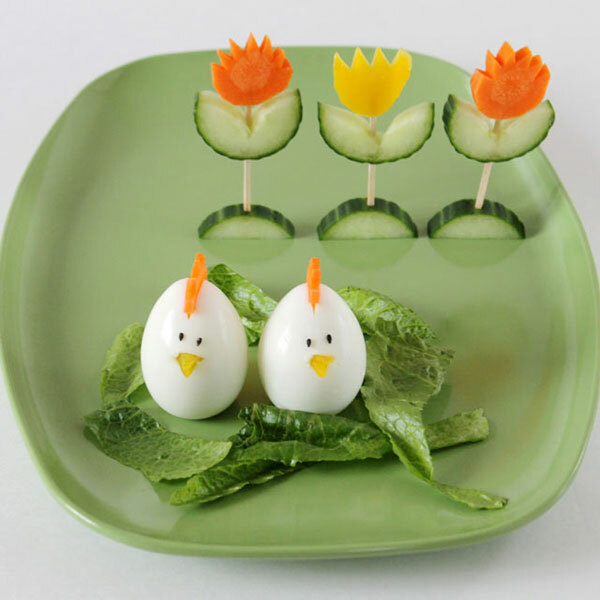 Dress up peeled, hard-boiled eggs as chickens using carrot slices for feathers and beaks, and sesame seeds for eyes. Place them on a bed of lettuce in a garden of flowers made from decorative cucumber and carrot flowers. These Easter bunny eggs from My Fudo will hop off their centerpiece and into the mouths of happy kids. Use radishes for the ears, celery for the whiskers, and sliced black olives for the eyes. 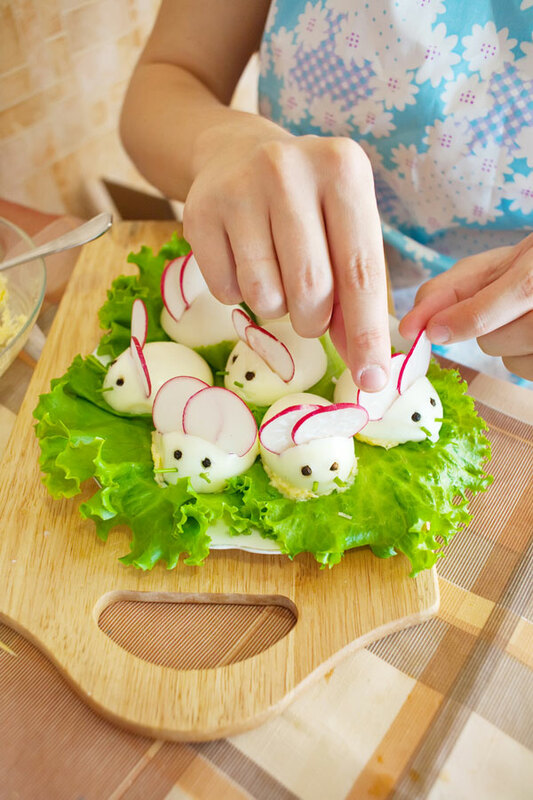 Set the bunnies on a bed of tuna, place it all on a plate of lettuce, and serve! Get full instructions here.